Frederick William Mausert, III was born on 1 May 1930 in Cambridge, NY. He went to elementary school in Brooklyn, NY, but attended high school in Monson, MA, where he played baseball, track, and basketball. He lived in Dresher, PA, before his enlistment in the Marine Corps on 21 June 1948. He was employed by Glenside Hardware, Glenside, PA. 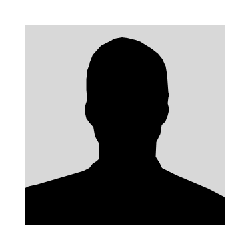 Following recruit training at Marine Corps Recruit Depot Parris Island, SC; he was stationed at Cherry Point and Camp Lejeune, NC, before going to Korea, where he participated in campaigns in South and Central Korea. Sergeant Frederick William Mausert III earned the Medal of Honor in Korea for sacrificing his life after repeated acts of heroism. The nation's highest military decoration for valor was awarded the young Marine for his extraordinary heroism on 12 September 1951, at Songnap-yong, where he was killed while leading an assault on enemy positions. He was the 20th Marine to be awarded the Medal of Honor during the Korean War. 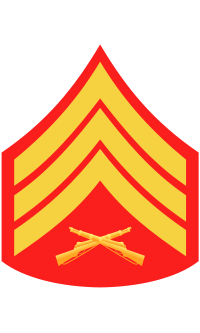 For conspicuous gallantry and intrepidity at the risk of his life above and beyond the call of duty while serving as a Squad Leader in Company B, First Battalion, Seventh Marines, First Marine Division (Reinforced), in action against enemy aggressor forces in Korea on 12 September 1951. With his company pinned down and suffering heavy casualties under murderous machine-gun, rifle, artillery and mortar fire laid down from heavily fortified, deeply entrenched hostile strongholds on Hill 673, Sergeant Mausert unhesitatingly left his covered position and ran through a heavily mined and fire-swept area to bring back two critically wounded men to the comparative safety of the lines. Staunchly refusing evacuation despite a painful head wound sustained during his voluntary act, he insisted on remaining with his squad and, with his platoon ordered into the assault moments later, took the point position and led his men in a furious bayonet charge against the first of a literally impregnable series of bunkers. Stunned and knocked to the ground when another bullet struck his helmet, he regained his feet and resumed his drive, personally silencing the machine-gun and leading his men in eliminating several other emplacements in the area. Promptly reorganizing his unit for a renewed fight to the final objective on top of the ridge, Sergeant Mausert boldly left his position when the enemy's fire gained momentum and, making a target of himself, boldly advanced alone into the face of the machine gun, drawing the fire away from his men and enabling them to move into position to assault. Again severely wounded when the enemy's fire found its mark, he still refused aid and continued spearheading the assault to the topmost machine-gun nest and bunkers, the last bulwark of the fanatic aggressors. Leaping into the wall of fire, he destroyed another machine-gun with grenades before he was mortally wounded by bursting grenades and machine-gun fire. Stouthearted and indomitable, Sergeant Mausert, by his fortitude, great personal valor and extraordinary heroism in the face of almost certain death, had inspired his men to sweep on, overrun and finally secure the objective. His unyielding courage throughout reflects the highest credit upon himself and the United States Naval Service. He gallantly gave his life for his country. 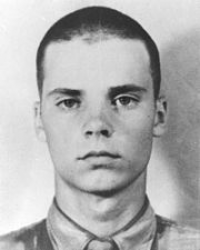 Sergeant Frederick William Mausert III was killed in action on 12 September 1951. He is buried at Arlington National Cemetery in Arlington, VA, in Section 12, Lot 5559, Map Grid BB 22.